Brand new listing ! Great views ! Great water ! Great for families / reunions !! BEAUTIFUL "GETAWAY" 5 BEDROOMS 4 BATHS AND DETACHED APARTMENT & KITCHENETTE !! Additional photos to be added next week for 2019 [2/14]. 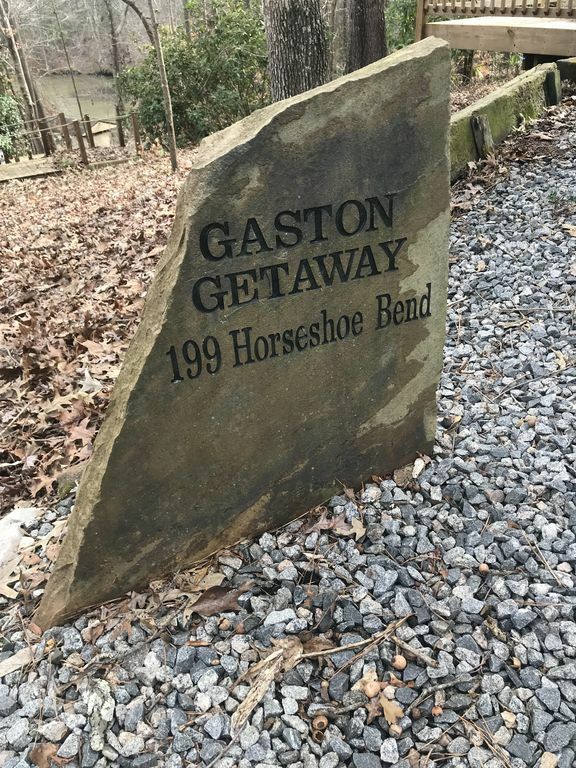 WOW....Our "GASTON GETAWAY" offers awesome views , deep water dock , firepit , most every kitchen amenity, all upgrades as well as a great 5 bedroom 4 bathroom retreat for a memorable reunion with friends and or family ! We make our second home available for just a handful of weeks especially during the peak summer season so please book early to get your first choice for your vacation . Call any time with any questions. Ask for Greg at 9196068775. We are in Raleigh NC. Thanx in advance for your interest ! Your search is now already over for a wonderful vacation at beautiful LAKE GASTON. Our second home is nestled precisely half way between Richmond to the north , Virginia Beach to the east and Raleigh to the south and is ideal for families to get reacquainted! We are also a mere 3 hour drive from the metro DC area. In 2019 we will offer our "Gaston Getaway" for just 6 peak weeks ! Don't miss out ! Thanx very much for your interest our "Retreat" ! This is now a totally renovated two and one-half story lake home with a newish 1000 square foot addition. The addition features a large dining room with comfortable seating for 12 , spacious kitchen with full amenities such granite countertops & tons of cabinetry. Also, added is a private downstairs master suite [450 square feet] with a tiled shower and whirlpool tub. The master suite, in addition, provides another great lake view & private access to the lake. There is also a detached efficiency apartment with kitchenette and full bath. This apartment certainly accommodates 4 teenagers or a couple with younger children. This property makes for an excellent "getaway" for family reunions or multi family groups. Just to be clear, the apartment for four IS included with the week's rental price.The apartment is only available March thru October. The main house has a newer 500 square-foot sun deck which provides an incredible main lake view. Also added in 2014 was a 10' by 10' covered deck area to keep some folks protected from the hot summer rays ! Its gentle lighted slope leads to a very large boat dock for water activities (8-feet deep). New landscaping enhances the overall appeal of this home. Plus , a brand new walkway with brick pavers make for an easy walk our expansive dock ! A 'firepit' allows for marshmellow roasts or just good late night conversation on cooler nights. This dwelling is also in close proximity to the Eaton Ferry Morningstar Marina for boat rentals and ramps. The Marina now offers a quality restaurant as well as live band in season concerts every weekend !! Freshly painted, redecorated with all new carpet and hardwoods, is smoke free. This adorable former 'A' frame [pre addition] now has four bedrooms plus a loft three full baths and a basement / gameroom with a 8' pool table with 1' slate as well as flatscreen "sportsbar" like TV. Beds include: four queen-size, a twin bed, one foldaway. The detached efficiency apartment has two full size futons with 8 inch thick mattresses, another full bath, kitchenette, and good size deck with another nice lake view. The efficiency is available only in conjunction with the main house to better serve your larger group. This apartment has a 14' by 14' deck as well ! Please call early or email early to reserve your extended family's or group's 1st choice of weeks. This is our second home and therefore rent it only a few weeks a year so don't miss out on a incredible relaxing & luxurious........... "Gaston Getaway" . We will also rent this property in the spring and fall for the occasional long weekend or holiday getaways in 2019 ! Thanx so much Greg & debbie. Greg and Debbie Dragos bought this vacation home in 2001 as a place our family could meet for family reunions. We totally renovated our 'gaston getaway' in 2010 and added 1000 square feet of kitchen, dining room, and master bedroom space. Debbie and I have our professions in nursing and teaching respectively. We love the ambiance of Lake Gaston and we think you will as well. We are now both officially retired but will continue to rent our "GASTON GETAWAY" on a limited basis. We are in a large yet protected cove just a minute or two from the main lake and within a mile or so by boat , of Morningstar Marina and The Pointe restaurant. "The Pointe" since 2014 features DJ's as well as live bands 2 - 3 nights a week from May thru September. The music accommodates a variety of musical appetites. OUR GREAT VIEW, WOODED LOT, FIRE PIT & LARGE DECK, YET COVE PROTECTED PROPERTY, LEADS TO A RELAXING AMBIANCE FOR SURE. OUR HUGE FULLY STOCKED GRANITE COUNTER TOPPED KITCHEN LEADS TO A CHEFS DELIGHT TO PREPARE FAMILY FEASTS. large dock 18' by 36' for tanning , swimming , reading , lounging, fishing ! PLEASE TURN BOTH THERMOSTATS UP TO 80 DEGRESS UPON LEAVING IN WARM WEATHER. 2 THERMOSTATS TO KEEP YOU WARM.PLEASE TURN DOWN TO 50 DEGREES UPON LEAVING IN COLD WEATHER. SORRY , WE DO NOT PROVIDE THIS SERVICE ! 2 fireplaces with gas logs. AMPLE GRAVEL PARKING AREA FOR AT LEAST 4 VEHICLES ! THERE IS NOT A GARAGE AVAILABLE ! FULLY STOCKED FOR YOUR FAMLY REUNION ! the new kitchen is huge and fully stocked with most anything needed to cook gourmet meals ! LARGE ENOUGH TO COMFORTABLY SEAT A DOZEN ADULTS ! THERE IS A SMALL COLLECTION OF VARIOUS BOOKS & MAGAZINES FOR YOUR PURUSAL ! THERE IS A SMALL SELECTION OF BOARD GAMES LIKE MONOPOLY & SCRABBLE. THERE IS AN EIGHT FOOT BILLIARD TABLEWITH 1' SOLID SLATE BASE. 25 popular DVD'S available ! THERE IS A NEW DECK 12 BY 40 FOOT DECK OVERLOOKING THE LAKE WITH ALL CUSHIONED LAWN FURNITURE ! THERE IS A LOCAL , LAKE GASTON GOLF CLUB [18 HOLES] WITHIN A 10 MINUTE DRIVE OF OUR 'GASTON GETAWAY' ! BRAND NEW 1' SLATE PROFESSIONAL STYLE 8' POOL TABLE.2 LARGE 50' SCREEN 1080 LCD TV FIREPLACE MOUNTEDLARGE 37' SCREEN 1080 LCD TV IN POOL ROOM BASEMENT FIREPLACE MOUNTED.WET BAR IN BASEMENT WITH DORM REFRIGERATOR !LARGE SCREENED PORCH [12' BY 30']HUGH NEWLY REPLANKED DOCK [18' BY 32'] WITH A BRAND NEW 10 BY 10 FOOT COVERED AREA FOR THOSE WANTING TO GET OUT OF THE SUN ! I arrived on Sunday afternoon after our family arrived on Saturday to find the kitchen un-clean. The family cleaned up and went on. I can't attest to the state of the kitchen since I did not see it but I can attest to the condition of the "Garage room" that my wife and I were unfortunately assigned to (Our daughter would not sleep there). It was very smelly. I guess the best description was musty, very musty. We aired it out as much as possible but it was still very pungent. All of our clothes had this "stink" on them after the stay. Even the clothes that did not come out of our bags needed to be washed. My Wife left on another trip the day after coming home from this property and she had to use luggage that did not make the trip to the Gaston Getaway because of the stink that stuck to everything.The shower in this area got "Luke Warm" at best and the wall A/C was very loud but it worked. Yeah! The main bathroom on the first floor of the house smelled of URINE near the toilet. Unfortunately, my opinion was that this area had not been cleaned either. I am a Registered Nurse so I am familiar with the smell of "old urine" and this was it. I also played pool with my Daughter down in the basement. My bare feet ended up so dirty! This hard surface floor evidently had not been cleaned either. Just disgusting in my opinion. The vaulted areas in the living room were totally dusty, with cobwebs as well. Great for someone with asthma! In my opinion the home owners need to find I different cleaning company. Or maybe do an inspection after the house is "cleaned" before commanding such a premium weekly rental. We found that the dock and swimming area to be very nice. Lake Gaston is a very clean lake and we enjoyed this. The dock area set up was very nicely, although some of the furniture was not that great. We enjoyed the swimming! With a deep cleaning and a fresh paint job inside, in my opinion this could be a nice property, unfortunately I did not find it to be one for our stay. Thanks to my Sister-in law for dealing with the owners of Gaston Getaway. I know this was a trying process! As Abe Lincoln once said : "you cant please all of the people all of the time ". Albeit , since our massive renovation some 8 years ago we have certainly attempted and have succeeded in making 99%+ of our renters feel welcomed and comfortable at our , "Gaston Getaway". On this singular occasion my wife, who was actually there when these renters arrived ,offered to reclean as needed as we have had a poor performance from our housekeeper.The renters declined this offer. Moving forward we will have a brand new housecleaning service beginning this month. The garage apartment was not used much this season and hence there was a mustiness to it and that has been addressed by completely sealing off the apartment from the rest of the garage.We also provided a several hundred dollar refund to appease these folks but apparently that too was insufficient.Please note that every previous review on VRBO has been very positive. This house allowed the perfect mix of R&R and excitement for a family of 14! We loved the location, which provided the privacy of a cove with the gorgeous main lake views. The dock setup was great; it has a shaded area for those who don't want to get too much sun. I appreciated this and didn't notice it with a lot of other docks on the lake. My grandmother can't walk all the way down to the dock, so the large shaded deck was a good option for her to enjoy the views. For entertainment, we had pool and ping pong tournaments, roasted marshmallows by the fire pit, went paddle boarding (there is a place to rent them locally), watched movies, played some games from the house and even found a few fun local bars and restaurants (check out The Pointe Cafe) that can be accessed easily by car or boat. The bedrooms were spacious and clean and we had plenty of room to spread out. This house was the perfect spot for our family reunion. Thanks for sharing your lovely home! Perfect for the active family! Very quite nicely furnished and equipped! Perfect for renting or bringing your own watercraft but check with owner first. Ramp from parking area to entrance great for adults with mobility issues (one of our group used s wheel chair and appreciated the first floor bedroom and bath). Great views from the deck across the cove to the lake! Stunning view and perfect lake location!! Absolutely stunning view of the main lake and large cove. This home has everything needed to enjoy your family vacation. We especially loved the beautiful well equipped kitchen and living space with large window water views and the large newly constructed dock for long afternoons and evenings by the water. The wooded private lot is also great for camp fires. Grocery stores, restaurants, churches, a marina, and a winery are in close proximity by car, or you can jump in your boat to visit nearby restaurants and marina. Gaston Getaway was a wonderful place for our extended family to vacation together. The home was ideal, large enough for people to lounge and outfitted to allow comfort and activities. Lake was quiet and conveniences were not far from the house. Greg was easy to work with and the lease was common sense. All in all, this was easy and fun. We enjoyed it ! My family loved this house! The pool table and ping pong table were such a big hit. We brought our own corn hole game and the huge deck was a perfect place to play while we were watching our fishing poles on the dock. (unfortunately no fish were caught, but I'm sure in warmer weather the lake has plenty of fish) The only thing we would have loved to have would be a canoe or john boat just to enjoy the lake a bit more. The surround sound speakers all over were so nice so we could listen to music while eating on the deck and then when watching a movie it was like being in a theatre. We loved that fact that we had no phone or internet service the whole time, it really made for some good family bonding. It was nice to have an ACE Hardware, Food Lion and Dollar General so close by for any last minute items we forgot. We really didn't tour the area at all as we were so happy to just stay at the house. Thank you Greg & Debbie for letting us stay at your beautiful house! We are very appreciative of the Jahoda's kind review. There are tons of fish off our dock.Maybe the snow scared them into deep water ! The no phone or internet was merely because we put those utilities "to sleep" only in the WINTER months to cut back on that bill.Thanx again Sherry !